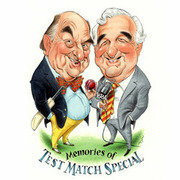 Two of cricket’s most famous voices descend from the commentary box to talk with Dan Lentell to discuss Blofeld and Baxter, the show which perfectly captures the irreverent spirit of their very special bromance. (Unedited to retain the TMS flavour). This entry was posted on Tuesday, August 20th, 2013 at 11:00 am and is filed under Audio Interviews, Edinburgh Festivals 2013, Edinburgh Fringe 2013. You can follow any responses to this entry through the RSS 2.0 feed. Both comments and pings are currently closed.